OFF-ROAD LIVE ! : OFF-ROAD REVIVAL! Summer 2017, Beach Events, Road Trips & MORE! OFF-ROAD REVIVAL! Summer 2017, Beach Events, Road Trips & MORE! 4PM WEST EVERY MONDAY LIVE! Desert Racing News and Information! Pre-Running Notes: Experienced Baja racers are calling this course, "a loser". The entrance to the race course as is the first 11 miles on the track. If you have been to El Casian or Rancho Casian before that is the turn off of Boulevard 2000 and it is a 2 mile dirt road that is gonna be tough as all racers and fans have only one way in and one way out. The El Casian turn from the north or TJ area requires a u turn to get on the access road. The first 11 miles of the course is more obstacle course than race course. It opens up for the 11-24 but still not a big course. From San Diego to Cabo San Lucas, Join OFF-ROAD LIVE! on Exclusive Insider Travel Packages from September 25 Thru November 30th. Cal4Wheel Benefit; Operation Desert Fun! *OFF-ROAD LIVE! Saturday, November 4, Noon -? Every Monday at 4PM West, we'll report ON THE BEACH Results, Ramblings and Rumors ALL SUMMER! ***CRANDON! THE BIG HOUSE SHOW! 6PM West Ensenada Short-Course racing action brought to YOU, LIVE! starting on Friday, via the Baja Racing Club. Join Us for the Party! Estero Beach Resort is the location for all the off-road shortcourse racing May 20-21. Perry McNeil AT his Baja Malibu property basking in the limelight of his "150" desert off-road race from this weekend, being interviewed LIVE! this morning on OFF-ROAD LIVE! BIG HOUSE BRAWL! CRANDON, WISC. OFF-ROAD LIVE! Fans can enjoy Music, Food, Beer & Inter-actives! FREE giveaways and much, much more! Admission is FREE! 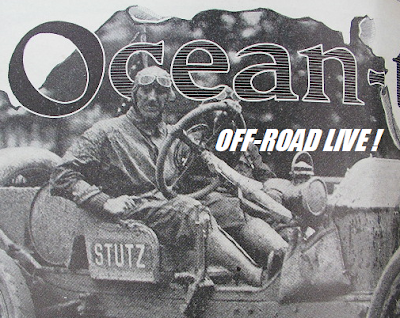 Wednesday, July 19, 5PM OFF-ROAD LIVE! LIVE! VEGAS TO RENO 2015 OFF-ROAD LIVE! Super Parker 425 RaceWeek Jan 30-Feb 4 LIVE! The Adventure of DAKAR, The Thrill of BAJA and The Style Of MONACO!